The Best of the Best Florida Elite Showcase held this past Saturday at the Cooper Palms Sportsplex in Apopka attracted a host of solid players in the classes of 2021 and 2022. Playing with a smoothness that belied his age, 6’3 Kanye Jones from The First Academy in Orlando easily stood out. A rising sophomore guard, Jones showed a knack for creating space when driving to the basket then pulling up and connecting on mid-range jump shots. He also scored at the basket when pushing the ball full speed in transition. Some nifty passes to cutters during the contest suggest Jones could evolve into a player than can play both backcourt positions in the future. 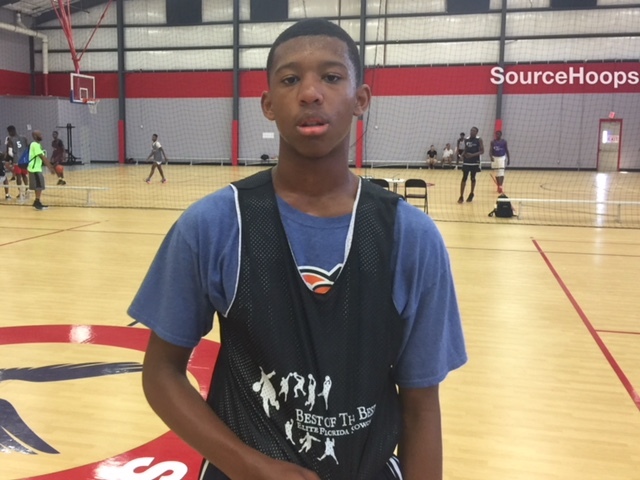 J.J. Harris, a 6’4 wing in the 2021 Class out of Orlando West Oaks Academy, is wired to score. Opponents found it very difficult to keep him out of the paint when he decided to drive the ball to the rim. Once there, Harris more often than not finds a way to get the ball into the basket. His jump shot continues to improve from beyond the arc and Harris is working diligently on making solid pass vs. shot decisions when attacking the defense. Defensively, he is very active and puts a lot of pressure on the opposing ball-handler. Arguably the best “young big” among this crop was 6’6 Craig Starks out of Miami. A member of the 2021 Class, he’s quick off his feet to grab rebounds or challenge shots around the basket. He’s moves well both up and down the court in transition as well as laterally when the defense is extended. Starks scored well inside with either hand, usually getting his shot up and into the basket before the defender could challenge. He didn’t display any perimeter skills but that should come in time. Jonathan Renois, a 5’11 rising sophomore guard out of Pembroke Pines Somerset Academy, is one of the more athletic point guards in that class. He’s quite quick to the basket and finishes very well in traffic. Renois leaps very well and is a productive rebounder from the backcourt. While he didn’t attempt any three point shots in the game we watched, his shots from inside the arc (12-18 feet) connected at a solid rate. Defensively he is solid, especially when guarding the basketball. One of the very few Class of 2021 players to play up in the JR/SR division was Maurice Willie out of the Paxon School in Jacksonville. The 5’10 guard played with poise and was quite productive. He made a pair of threes (one a step-back off the dribble), connected on a mid-range pull-up, and delivered a pair of assists in transition. Willie proved to be fast with the basketball but didn’t play too fast or out of control with the ball in his hands. Though just 6’4 at this time, Miami Carol City sophomore Rashad Parms is quite an effective interior player. He is a very active rebounder at both ends of the floor and gets the ball up and in quickly when catching the ball in the paint. Parms has a nose for the ball at the defensive end and comes up with a surprising number of steals and deflections. His perimeter skills did show improvement as he knocked down an open look at a three and made a couple of nice passes to cutters for easy baskets. We were impressed by the play of Steven Burr, a 5’9 sophomore guard from Orlando Oakridge. He handled the ball well vs. pressure, kept his head up, continually searching for open teammates, and generally made good decisions with the basketball. He found success in scoring off the drive early on but later showed he could make shots from the perimeter. A pair of freshmen from Orlando Christian Prep made the most of their opportunities on Saturday. Anthony Brown, a 6’3 wing, filled the stat sheet with a pair of threes, a couple of steals, some tough finishes in transition, and a propensity for grabbing rebounds on the offensive end. It seemed like every other time down the court he was making a positive play for his team. We didn’t see much in terms of ball-handling or making plays off the dribble but that should come in time. OCP teammate, 6’2 guard Fabio Basili, is a solid and crafty ball-handler. On Saturday, he continually got into the lane to break down the defense. Once there, he generally made good pass vs. shot decisions. When Basili decided to shoot after driving to the hole, he scored or earned a trip to the foul line. His shooting form looks solid and he did connect on the lone three pointer he took in the contest we watched. Basili and Brown could be a potent combo for OCP in the not too distant future.